On course to smash a variety of records over their five remaining games, Manchester City’s 2017/18 campaign is set to be remembered as the most dominant Premier League title win of all time. But it’s easy to forget that Pep Guardiola’s side built their campaign on so much more than simply fine football. What makes this City side so exceptional, aside from the fact it lacks a powerful core that was previously seen as essential to success in English football, is how they’ve combined that technical flair and ingenuity with the belief, determination and mercilessness of serial trophy winners. While opponents rolling over at the Etihad Stadium by lowering their ambitions to merely limiting the damage to their goal difference has become a disappointing trend of the latter portions of the campaign, City laid this season’s foundations on doing things the hard way too, earning the right to play in such a commandingly aesthetic fashion by proving so relentless in search of victory. Indeed, nine of City’s 28 Premier League wins this season have been decided by a single goal, and the first of those was way back in August when Guardiola’s boys made the trip to the Vitality Stadium – a ground where Bournemouth have taken points off Arsenal, Liverpool, Manchester United and Tottenham since arriving in the Premier League three years ago. And on that day, it was actually Bournemouth who started out on the front foot as Eddie Howe’s 5-3-2 setup appeared to leave the future champions somewhat perplexed. The Cherries created a succession of half-chances in the opening stages as the sun beat down on the south coast, and the early pressure told when Charlie Daniels, marauding on from left wing-back, connected with a weak clearance through the most delicious of volleys at the most acute of angles, smashing the ball from the left of the penalty area to the top right corner of Ederson’s net. An early Goal of the Season contender, and August’s Goal of the Month in the Premier League. 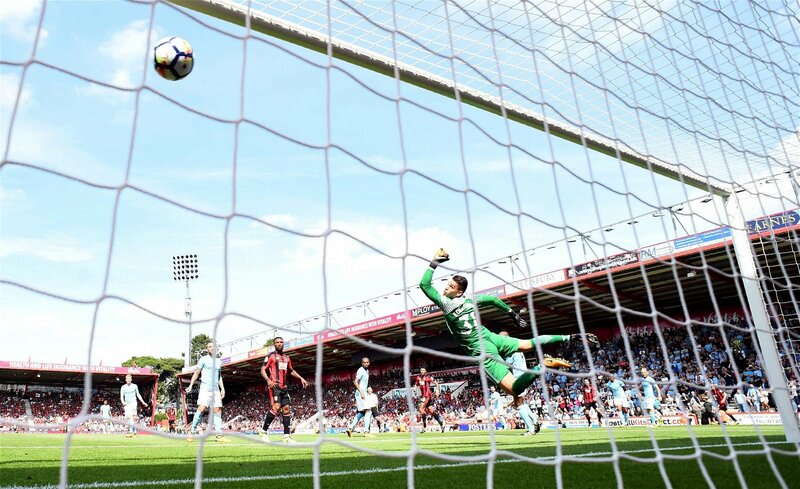 Even with just 13 minutes gone, that wonderstrike created the feeling that this just might not be City’s day or their season – for all the money spent on full-backs and goalkeepers during the summer, for all of Guardiola’s endorsement of the idealism of his philosophy over the seemingly compulsory pragmatism of the Premier League, Bournemouth had rocked them just 15 minutes into their third game of the campaign. Doubt could and probably should have crept in – the game previous, City had drawn 1-1 to Ronald Koeman’s unspectacular Everton at home and even the routine win over Brighton on the opening day of the campaign lacked the imposing play we’ve come to expect from this side. Manchester United, meanwhile, had started the term with a canter, demolishing West Ham 4-0 at Old Trafford. City sceptics momentarily felt validated that Guardiola’s master-plan couldn’t conquer the underdog romanticism of English football. This setback though, only catalysed the metamorphosis City needed to become Premier League champions; the transformation from a side that proved they could entertain last season to the team that has dropped just twelve points this term, from eye-catching globe-trotters to a relentless winning machine, as smart and game-savvy as idealistically aesthetic. 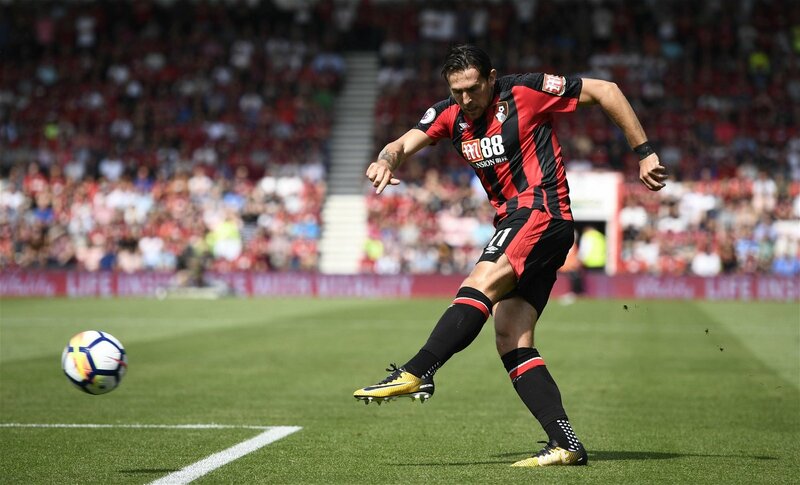 Just eight minutes after Daniels’ wonderstrike, Bernardo Silva took a quick free kick just inside the Cherries’ half, David Silva instantly slid the ball in between Bournemouth’s centre-backs and Gabriel Jesus tucked home City’s equaliser. From that point, it became a question of faith in not only their own abilities, but also Guardiola’s methodology – faith they’d need to maintain until the seventh minute of stoppage time. While Manchester United under Sir Alex Ferguson would have eventually succumbed to hoofed hooks into the mixer in search of a late winner, City remained adamant in playing through Bournemouth, defiant that the single chance they needed would eventually come. While that only opened the pitch up to increase the likelihood of a late Cherries goal, the pressure eventually told. Seconds after a Bournemouth counter-attack deep into stoppage time, Sergio Aguero held off a defender and squeezed the ball to Raheem Sterling, the England international interchanged with Kevin De Bruyne on the edge of the box and when the play moved out to the right wing, it was the 23-year-old who connected with Danilo’s cross – scooping a shot into the top of the net, beyond the reach of a static Asmir Begovic. For a number of reasons, that goal was vitally significant to City’s season. First and foremost, they would have begun the campaign with just five points from three games, slowing the accumulation of authority they quickly went on to enjoy. Secondly, it was a crucial moment for Sterling who had been left out of the starting XI for City’s first two games – Guardiola predicted after the match that the late goal would inspire the Three Lions forward to start scoring regularly and his total for the season now stands at 22, more than double his previous career best, including the second-biggest scoring contribution to City’s Premier League title (17 goals) after Aguero. But more crucially, it dispelled a myth about City that not only owed to scrutiny of Guardiola’s philosophy but also the mentality of the club before the Catalan’s arrival. 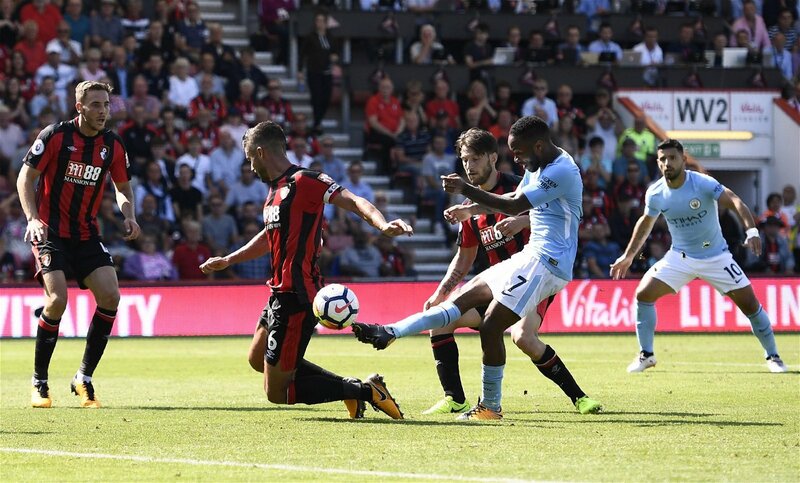 Whereas City had constructed several eye-catching teams previously, this one proved against Bournemouth that they could dig deep as well – so deep that they’d need to seal the win in the seventh minute of stoppage time. Perhaps that’s why the moment the match is remembered for happened next. After Sterling lead wild celebrations, rushing into the path of supporters that were spilling onto the pitch, Mike Dean showed him a second yellow card followed by a red. Now though, that suspension seems a small price to pay for a moment that became almost a template for City, a source of inspiration for their many hard-fought wins throughout the first half of the campaign. It was the first of five game-winning goals in the top flight for Sterling this season, and the first of four winners from those games won by a single goal that was netted after the 80th minute. Indeed, as much as the utter dominance over divisional rivals, as much as the unparalleled control of possession indiscriminate of the opposition, as much as the absence of a typical midfield powerhouse, and as much as Guardiola’s idiosyncratic reshuffles of formations, last-gasp wins like the one at the Vitality Stadium in August have shaped City’s special campaign.